Dwayne Perreault — Winefields Auctioneers’ first auction of 2011 was held on Sunday April 3rd in the Oranjekerk in Amsterdam. Started exactly five years ago by Milan Veld and Martin Derksen, Winefields has grown into Amsterdam’s second largest wine auction house, regularly holding auctions specifically for wine in both Amsterdam and Singapore. Once again, we see the Rothschild first growth estates dominating the list, with only Latour and the Pomerol Château Clinet appearing with them. Obviously, the highest prices were paid for Lafite, which because of Asian demand has seen its prices skyrocket. David has been posting quite regularly on this subject. It seems anything Lafite is being purchased and shipped to China. There were 33 wines opened and available to taste before and during the auction, and I had the privilege to stand behind the table and pour with Mark Savage MW. This remarkable man became a Master of Wine when I was just seventeen and drinking sweet sparkling labrusca wines in Canada. His day involved getting up at 4 am, catching a plane to Amsterdam, controlling every wine for cork, putting in a full day’s service and then accompanying us for dinner. I believe the next day he was off to the Veneto and Friuli. I was of course too busy pouring these delicious wines to contemplate them much or make tasting notes, but some of the more memorable specimens which touched my lips were the Château Giscours 1975, with practically nothing left of the label but still a lot of wine. The Saint-Aubin 1988 from Domaine Jean Lafouge was Mark Savage’s noteworthy pick, and it was wonderful. Also the Savigny-Les-Beaune ‘Les Grands Liards’ 1979 from Albert Guyot was very intriguing, as was the Château Palmer 1970 (“love those bones,” one afficianado told me). But strangely, my favourite wine on the table was a Coteaux du Languedoc, La Clape, Château de la Negly ‘La Falaise’ 1998. La Clape is a fairly recent discovery for me and I’m blown away by the sweet fruit and mineral concentration. I’m exploring a lot more of this as you read this, as I am currently in St. Chinian for two weeks. So a blog posting or two on the Languedoc is coming up. 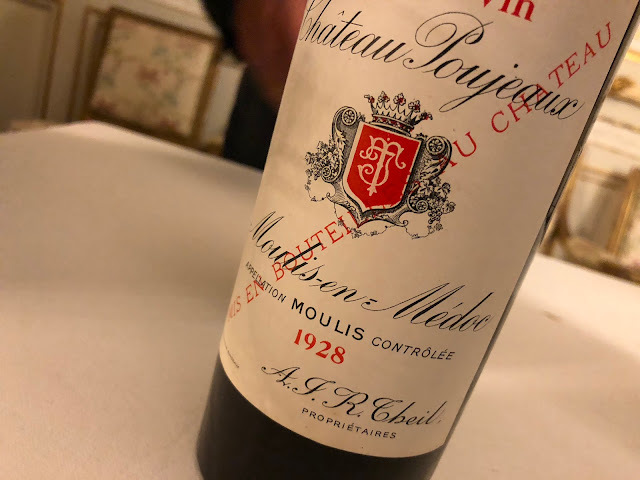 But the crown jewel came later that evening after dinner: a Château d’Yquem 1959, 100 Parker points and all, perhaps the greatest vintage year of the last century. It came with a surfeit of pleasures, perhaps just like 1959, the culmination of a decade of optimism and prosperity. A good token and a great wine: I wonder if the Chinese have discovered it?